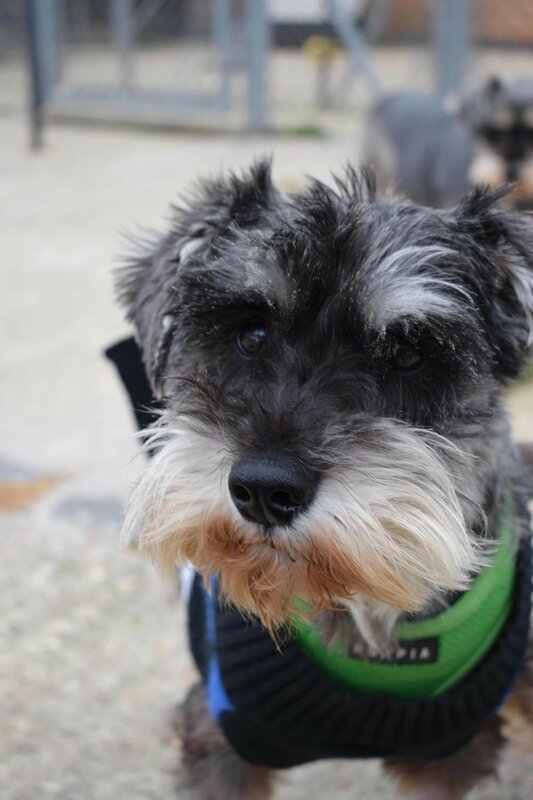 At the end of January, an 8 year old miniature schnauzer arrived at the Diana Brimblecombe Animal Rescue Centre, having escaped life as a breeder in a puppy farm. It’s unknown how many litters in those eight long years she would have produced before being discarded by the breeder, but judging by the poor state of her, it was many. However, unlike the other dogs who arrived with her, she seemed a good weight, if anything, plump. She spent a few days settling in at DBARC under the experienced eye of manager Janet and her team. She was given the name Lara and her journey from being an unloved, nameless commodity to a loved and cherished dog, got underway. Within a few days, it became clear that something was seriously amiss. Not only was she plump, she was visibly getting rounder by the day. This could mean several things, from pregnancy to tumours and a range of other things, none of them good. Having just had one of her companions diagnosed with tumours, gloom fell upon DBARC as Lara was whisked off to the vet for investigations. The shocking news came back - Lara was pregnant! She was too far gone for anything to be done except to support her the best way possible. It was a bitter sweet moment for those caring for her to realise that if the puppy farmer had known she was pregnant there was no way she’d have been given up; so although it was bad news she was pregnant, the good news was that she was free of the puppy farmer’s clutches. And even better they would not have her puppies to sell. Her previous value in the world would only have been the puppies she produced. All that, now changed for Lara and determination set in to give her everything she needed to get through this, her last ever pregnancy. As she was clearly not in good health, pregnancy, whelping and raising a litter would make severe demands on her already weakened, drained body. But at least she was in a place of safety and everything would be done that could be done. The brightest spot on a day of difficult news was that for Lara, when the time came, she wouldn’t be delivering puppies scared and alone in a filthy, grim, puppy farm. She was with the DBARC team. It was impossible to know for sure how many pups she was expecting, or when they would arrive; scans suggested around 4 puppies but as they often hide behind each other, Janet knew this could at best be just an estimate. A couple of weeks later, as Lara’s belly grew and grew, delivery seemed imminent; as date of mating was unknown everyone was on tenterhooks for days and serious concerns for Lara’s health increased. Janet took her every day for the final week to be scanned and when the puppies heartbeats dropped, delivery by caesarean section was immediately scheduled. Lara’s puppies arrived into the world: an astonishingly large litter of 10 puppies - 6 girls, 4 boys. Her breeding days were emphatically over! Sadly her troubles were far from behind her as Lara suffered serious post-operative complications. She was rushed in as an emergency and to save her life further surgery was required and it was touch and go whether she would pull through. Her puppies were just days old and Janet and her small team of volunteers immediately put in place a complex regime of 24 hour feeding and care for the 10 vulnerable puppies. For them to stand any chance of surviving, feeds initially had to be given every 2 hours, and with so many puppies to feed, this was a mammoth task for a small team to undertake. For a single person, each feed took at least 2 hours. In the small hours of many mornings, there were understandable dips in morale as ten fragile lives hung in the balance. But, the DBARC team pulled out all the stops; a dedicated group of volunteers worked day and night and as each 24 hours passed, and the puppies fed and grew, and pulled through each crisis, it was clear that Lara’s family was determined to live. While the puppies took up huge amounts of time and resources, the usual work of DBARC had to continue. This was a big demand on a small animal rescue, but not once did anyone flinch from what was needed for Lara and her puppies. 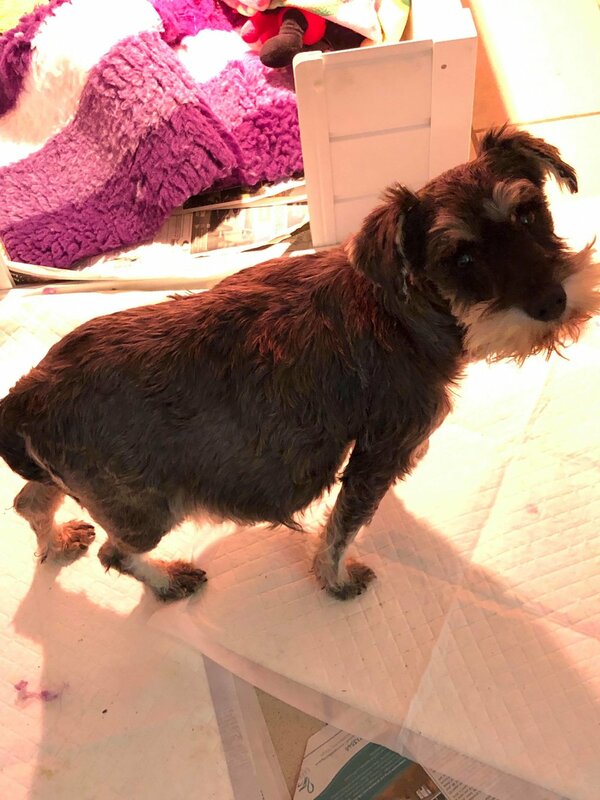 We’re proud that among others, Schnauzerfest volunteers made themselves available to help at this critical time, to give a hand feeding, cleaning and doing what they could to help ease the pressure on DBARC. While her puppies were being hand reared, Lara herself was recovering from everything she had been through and as soon as she was well enough, she was reunited with her family. Before the post-op complications and her emergency surgery, she’d shown herself to be a fantastic, dedicated mother, but it was not guaranteed she wouldn’t reject them now. She would also not be able to feed her puppies and their intensive care by the DBARC team continued without let up. All that mattered now to everyone closely involved in this no-so-little family’s lives was that they all survived, whatever it took. To the great relief of everyone involved, when Lara and her ten puppies were reunited, she immediately set about caring for each and every one of her babies. All ten of Lara’s puppies, together and about to be reunited with mum. The DBARC team have continued their stringent, demanding 24 hour regime of keeping them alive. Manager Janet has been up in the late hours of the night and early hours of the morning, all the while maintaining normal business at DBARC. Every carer of these precious pups have marvelled through their tiredness at how perfect a mother Lara is, despite everything she’s been through. And not just with this large litter, but in her entire life before reaching safety at DBARC. All 10 puppies are now thriving and at 4 weeks old, are developing at a rapid and healthy rate. They’re beginning to move around independently, their individual characters are showing through and play is very much in the minds of each of them. Eat, play, sleep, the life every puppy should have! In their remaining time under the expert care of DBARC they’ll be given everything that healthy, normal puppies should have in order to head off to their new lives. The puppies are currently enjoying time with their mum in a foster home, they all almost certainly have homes lined up and we very much look forward to sharing news of their lives in future. Lara will stay with DBARC for a good while, she needs to recover her health, and be properly assessed as to what her full needs are. Not only post pregnancy, but as a dog who has been neglected for years whilst being forced to produce litters for the puppy farmer, who would be kicking themselves black and blue if they knew the story of the ten little pups who got away. larger than average litter, 10 is a lot of puppies! The total financial cost of care won’t be known for some while. But an indication of why fundraising for veterinary bills is so important is that the costs of Lara’s c-section and life-saving post-op surgery amount to almost £5000 alone. Every donation made helps dogs like Lara. Thank you for caring, donating and supporting.